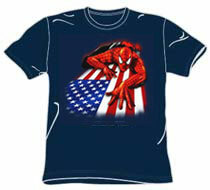 Great looking variation on Spiderman shirt. Spider image on the front is printed with red-orange-yellow ink that closely resembles the colors in a flame. 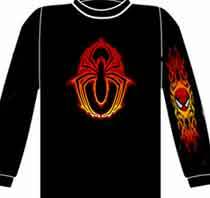 The Spiderman head surrounded by more flames down the top of one sleeve. Intense! Printed on black, 100% cotton pre-shrunk long sleeve tee. Retired style. Adult sizes Small and Medium left in stock.